You are here: Home / Nyelv / Angol nyelvű / Arabian henna (black henna) is dangerous! Forrás: Indian Express. Szerző: Tanbir Dhaliwal. With Karva Chauth around the corner, one will find mehndi artists at every nook and corner of markets, who are flocked by women and young girls to decorate their palms with different designs. It is believed that the colour of henna reflects the amount of love between a couple, but as per doctors, it reflects the amount of hazardous chemicals in henna. Every year, just after Karva Chauth, hundreds of women line up at dermatologists’ clinics with red and swollen hands. Doctors say that with the increase in chemical content in henna, the number of women complaining of skin allergies increases every year at the dermatologists’ clinics. “After a few days of Karva Chauth, the footfall of women complaining about itching, redness and skin reaction increases at the dermatology department of GMCH-32,” says Dr G P Thami, dermatologist, GMCH-32. The doctor adds that a week after Karva Chauth, 10-20 women visit the hospital per day and complain about skin reactions. Every year it happens and it continues for two-three weeks. 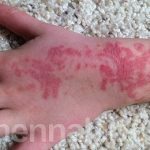 “These days, a very harmful chemical is used to darken henna. It can lead to severe problems. In worst cases, there are chances of breathlessness, heart sinking and other problems,” adds Dr Thami. Common symptoms of skin reactions are intense redness, itching, swelling, boils and pigmentation. The pain remains for weeks.